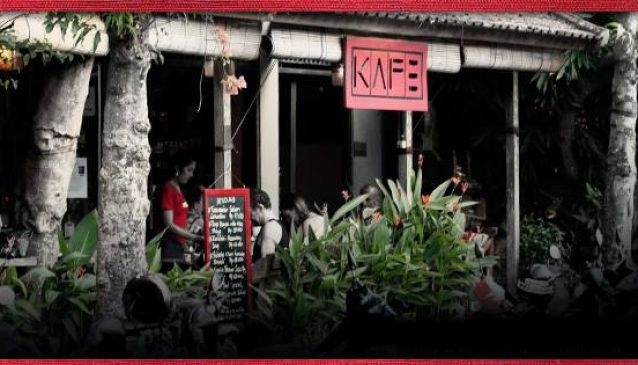 Located one street east of Jalan Monkey Forest, Kafe opened in 2005 to instant popularity. Kafe combines the atmosphere of a tropical café with the style of a San Francisco bistro. Designed for lounging, all the furniture and fittings are made from recycled wood hand constructed by Dek's Studio, reflecting the environmental commitment of its owners who also own the reknown folk art boutique, Tegun Galeri. The food and beverages at Kafe also reflect the owners' dedication to a healthy lifestyle, including a refusal to sell soft drinks. Using Bali harvested chemical-free & organic produce whenever possible, the kitchen produces a mouth-watering variety of exciting vegetarian and non-vegetarian options for every meal. Many visitors return again and again to meet one another and work their way through the menu.